"Recorded in the summer of 2009, 'My Name' and 'The War' were two of the first songs ever written and recorded by The Babies (Cassie Ramone of Vivian Girls and Kevin Morby of Woods). 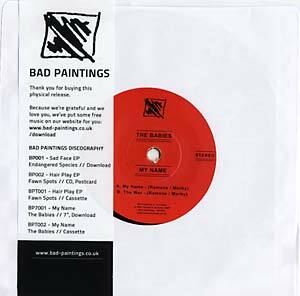 Capturing the band's raw energy and honest, direct sound, the single also marks the first 7 inch release for fledging UK label, Bad Paintings. Indebted to classic '60s song writing and garage rock by the likes of The Creation, this single shows The Babies at their most open and organic."